For the Super Bowl 2017, Hyundai and its agency of record Innocean Worldwide Americas connected active members of the US military with loved ones half a world away. 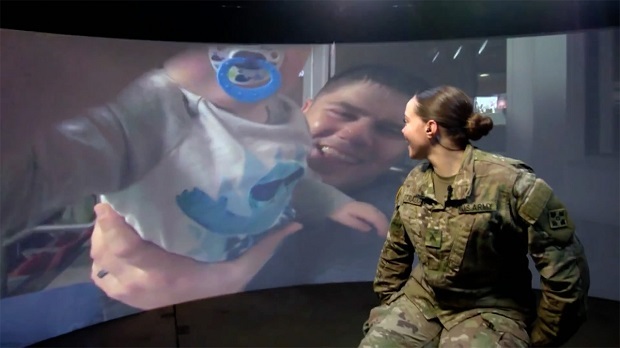 The planning phase started months before with the idea of surprising US troops stationed abroad on Super Bowl Sunday with virtual visits from their family members in the states. The ad was completely filmed during the game at both Houston’s NRG Stadium and a military base in Zagan, Poland, then aired immediately after the Patriots came back to win the first Super Bowl to need overtime. The ad was a joint collaboration between NFL, Fox Sports, the Department of Defense and a team of strategists, creatives and planners on the media and client sides. Agency partner Innocean Worldwide Americas helped create the 90-second spot—Hyundai bought all three 30-second slots that immediately follow the confetti drop. Footage from Houston and Poland was edited and produced in a production trailer outside the stadium during the game. Soldiers in the documentary include Corporal Trista Strauch, Specialist Erik Guerrero and Sergeant Richard Morrill. Running an ad during the Super Bowl that doesn’t feature one vehicle is a bold move, but Hyundai was going for something bigger than car sales. The automaker went with a military theme because "we owe so much to our troops and that is the one unifier that we have in our country right now," according to Hyundai Motor North America Chief Marketing Officer Dean Evan. The spot came mid growing political divisions in the nation, centred by debates over immigration and refugee rights but extending much further. "We are not trying to take any political sides," Evans said. Hyundai is "really trying to get everyone to rally around some common points, which is patriotism," he said. The platform moves away from rational buying points and into a more emotional pitch of improving people's lives.